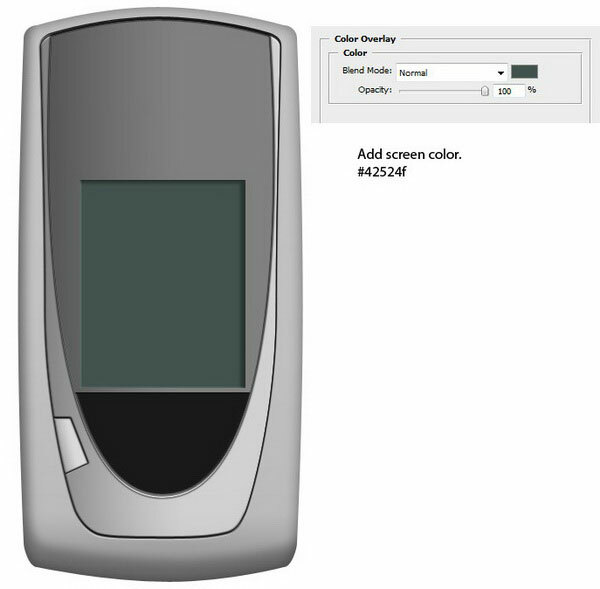 First, let’s take a look at the cell phone we’re going to create in this tutorial. 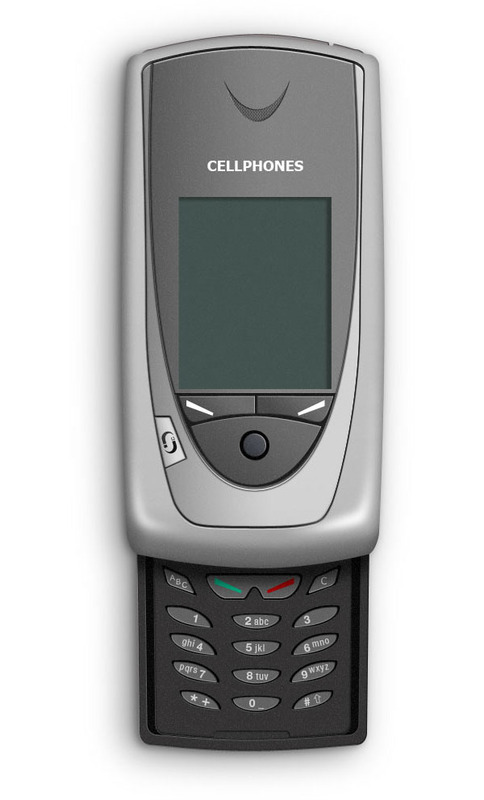 This cell phone is modeled after one of Nokia’s products. The most important factor in creating a realistic product digitally is consistency with the light sources. Therefore, before you draw anything, you must determine where light is coming from because it will affect the detailing, coloring, and shading of your work. In this tutorial, we will pick the top right corner of the canvas for our light source. The first consequence of this is that the shadows will be at the bottom left of object. The second result of having the light source at the right side is that the object will be darker on the left side. Let us begin drawing. 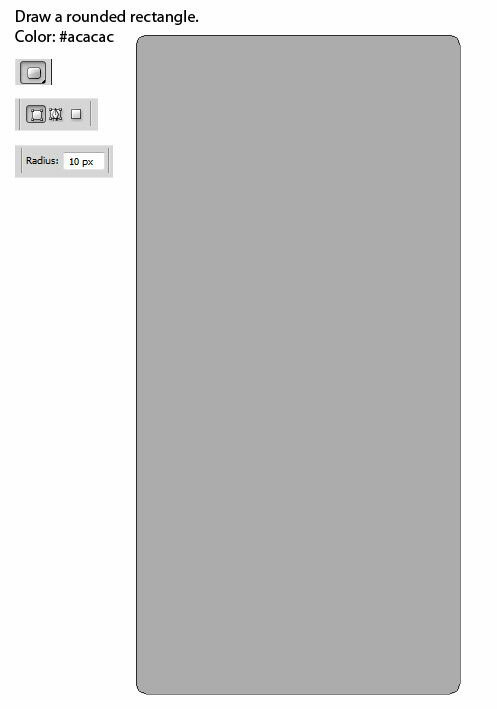 First, in Photoshop, create a new document (Ctrl/Cmd + N) with Width at 500px and Height at 1000px. 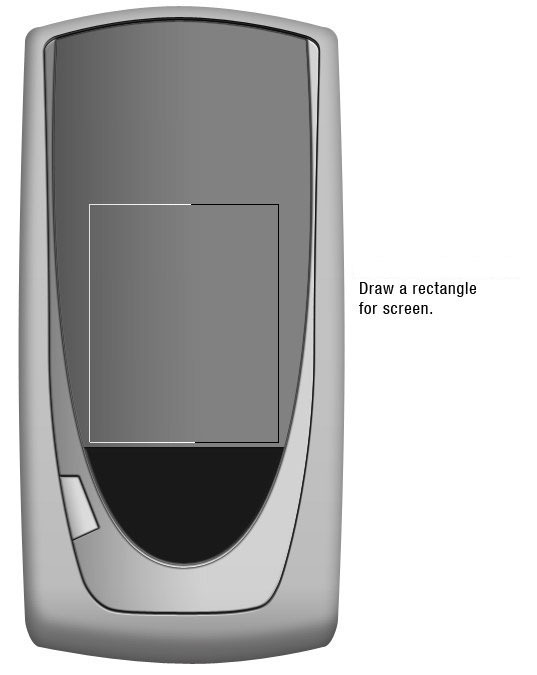 Start by drawing the main base shape of the cell phone. 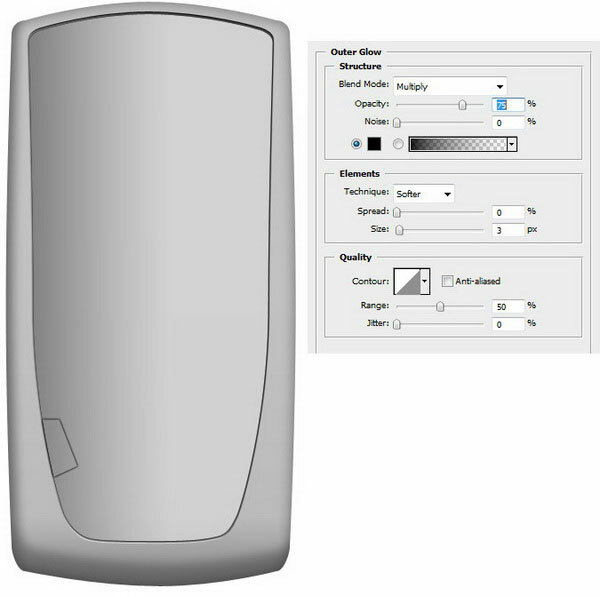 Usually, it’s easier to begin by drawing a predefined basic shape such as rectangle, ellipse, or star, then edit it manually using the Pen Tool (P). 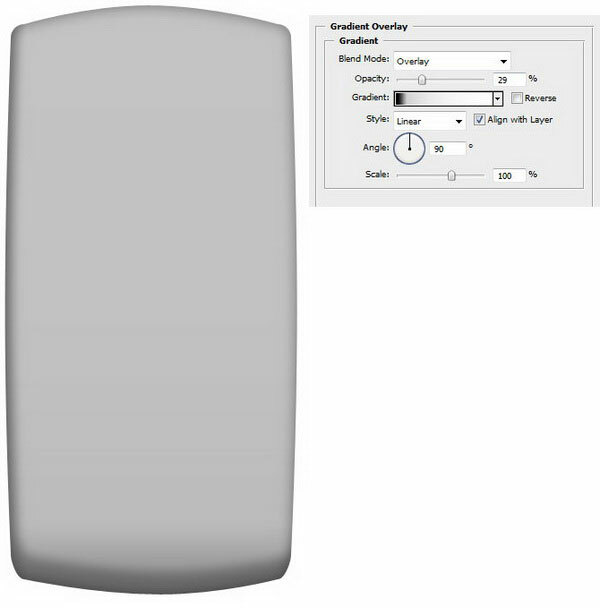 In this case, the basic shape is a rounded rectangle. 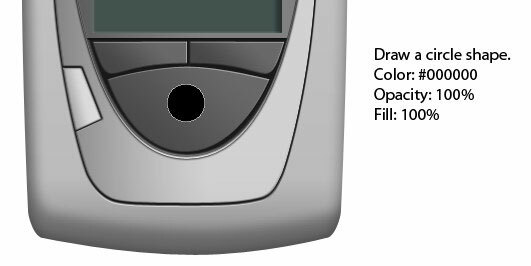 Draw a rounded rectangle with the Rounded Rectangle Tool (U) with Radius set at 10px and Color set to a gray color (#acacac). 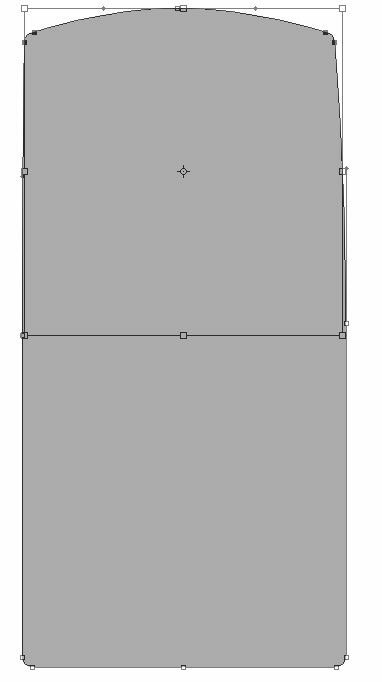 With the Pen Tool (P), make 4 additional anchor points by clicking on the shape’s path at the middle of each side. Select the corner anchor points at the top and pull them down to create a hump at the top middle of the shape. Press Ctrl/Cmd + T to activate the Free Transform command for the selected points. Hold down Alt and move them inward. 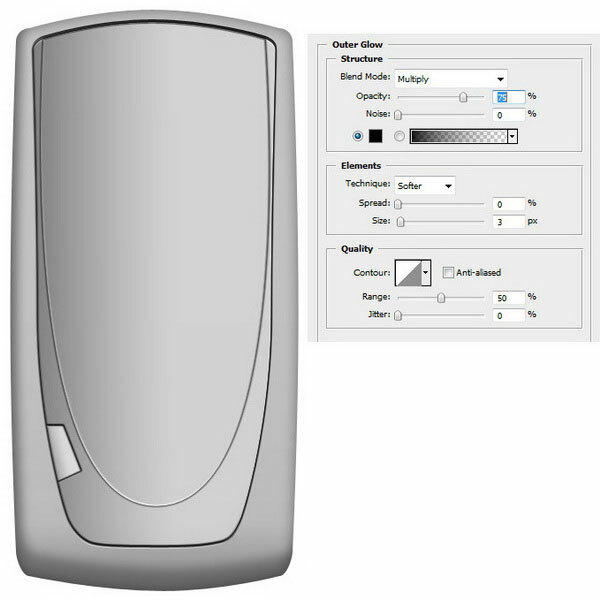 Repeat the same process for the bottom portion of the base shape. Note: We will be using this technique quite frequently in this tutorial, so it’s best to get the hang of it now. 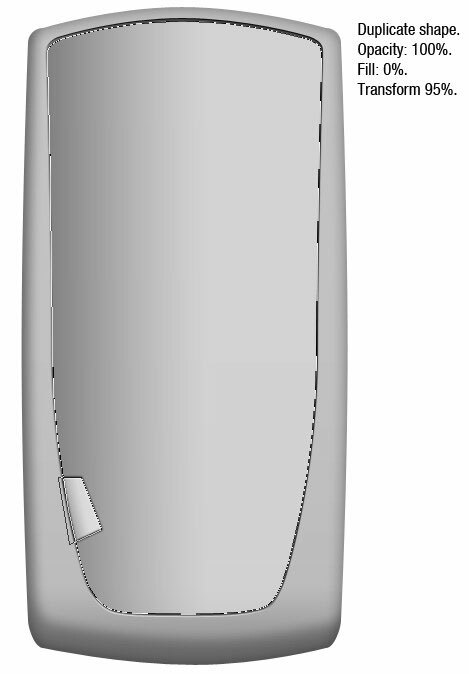 After creating the base shape, we need to add some layer styles to its layer to give it a realistic look. We will add an Inner Shadow, an Inner Glow, and a Gradient Overlay. These layer styles will add a 3D effect onto the shape. To apply layer styles, double-click on the layer in the Layers Panel, which should open the Layer Styles dialog window. 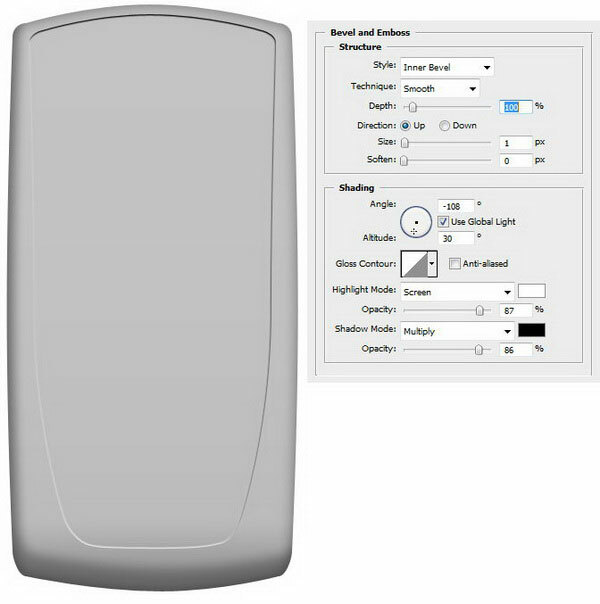 Use Rounded Rectangle Tool (U) combined with the Free Transform command to draw the inner shape. 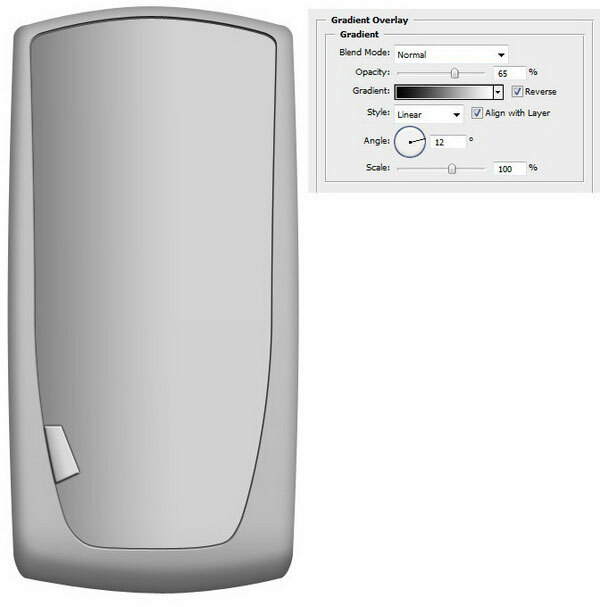 Use the same technique that we used for drawing the base shape. Make sure to remove the fill of this shape by right-clicking inside of its path on your canvas, choosing Blending Options from the contextual menu, then under Advanced Blending, lowering the Fill Opacity to 0%. 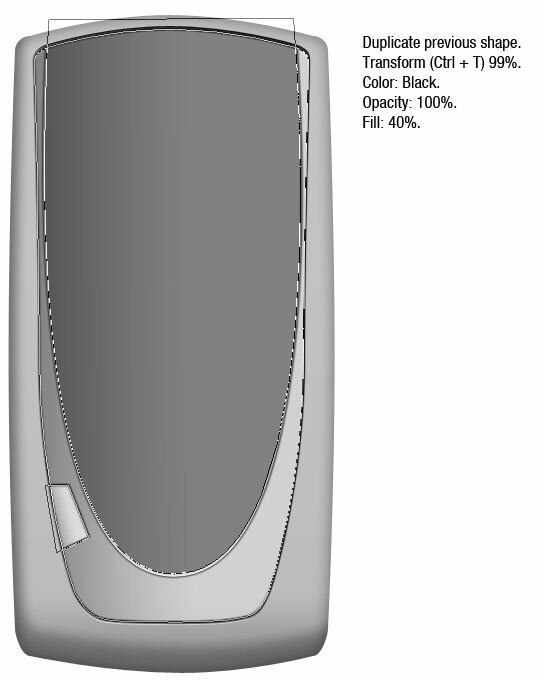 We will make it look as if the inner area is pressed down into the base shape. We can do this by giving its layer a Bevel and Emboss layer style and a Gradient Overlay layer style. 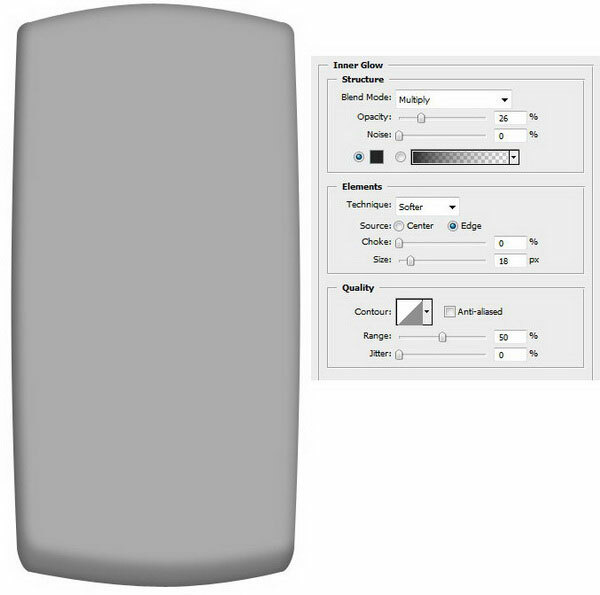 Duplicate the shape we have just created by selecting it in the Layers Panel and then pressing Ctrl/Cmd + J. Scale it down to 95% of its original size using Edit > Transform Path > Scale. You can also do this freehand using Free Transform (Ctrl/Cmd + T), it’s up to you how accurate you want to be. Give our duplicated inner shape an Outer Glow and a Gradient Overlay (you know the drill by now). 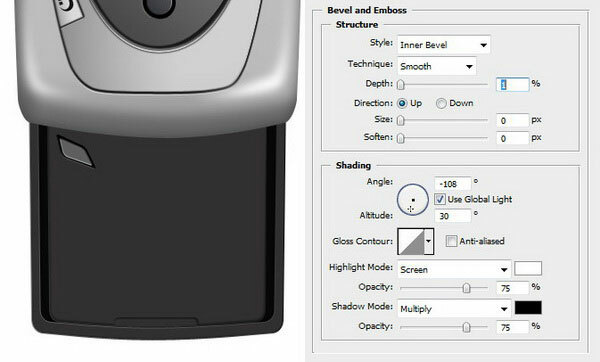 Make sure to adjust the layer styles’ options to match the direction of our light source. 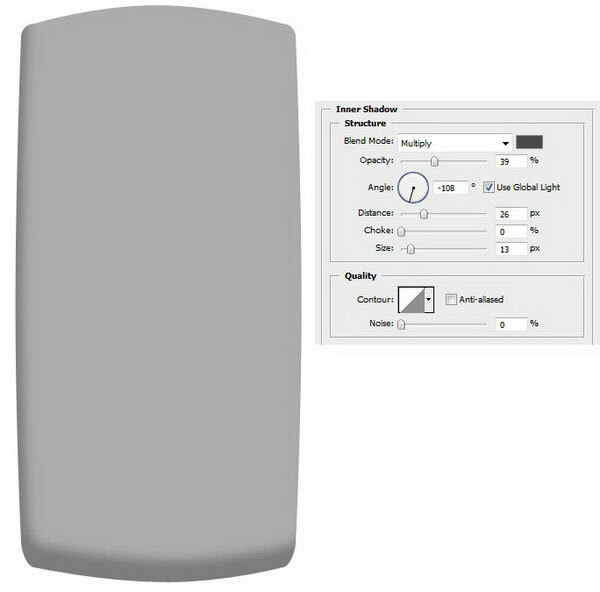 Duplicate the shape layer (Ctrl/Cmd + J) we just made. Use the Pen Tool (P), but switch the mode to Paths and utilize the Intersect path areas option in the Options Bar (this saves us from having to be very accurate on the edge of the inner shape). 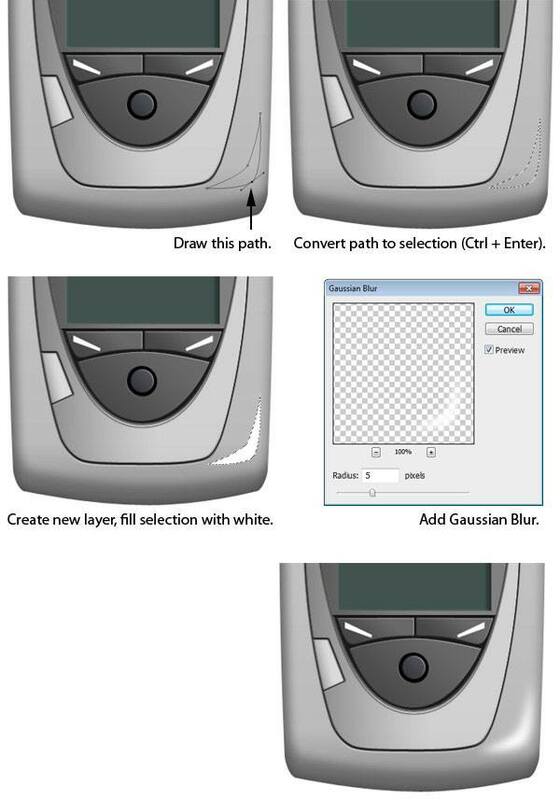 With the Pen Tool, draw a path that represents the right button on the most recently duplicated layer. Next, apply an Outer Glow, a Bevel and Emboss, and a Gradient Overlay. 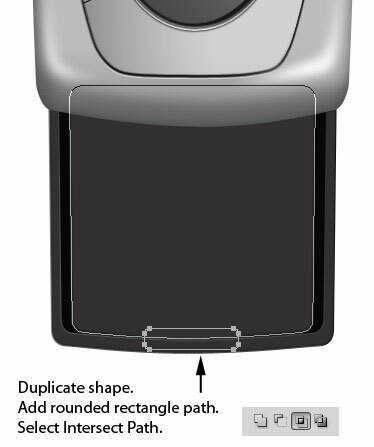 Duplicate the button shape. 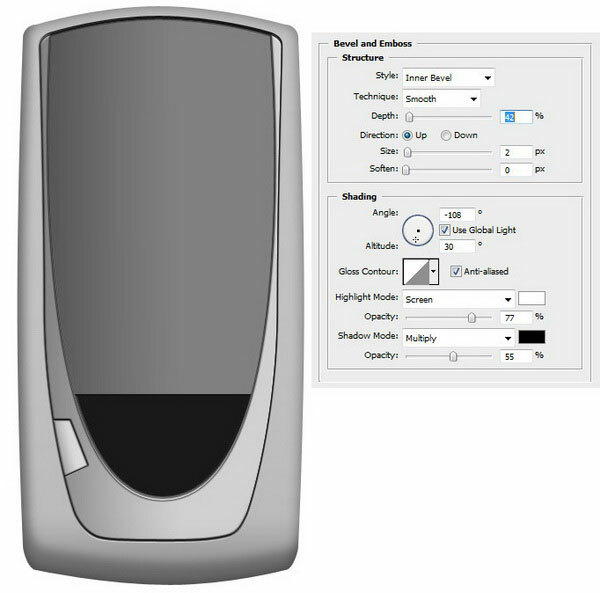 Use Free Transform on it by hitting Ctrl/Cmd + T. Inside the transform control box, right-click and then choose Scale from the menu. 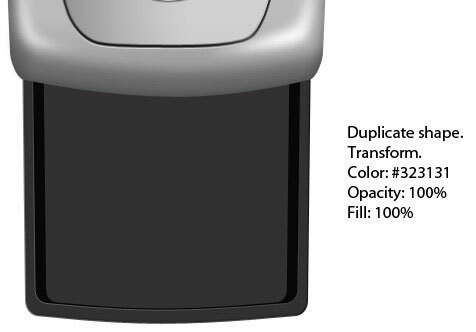 Change the size of the duplicated button to 95%. 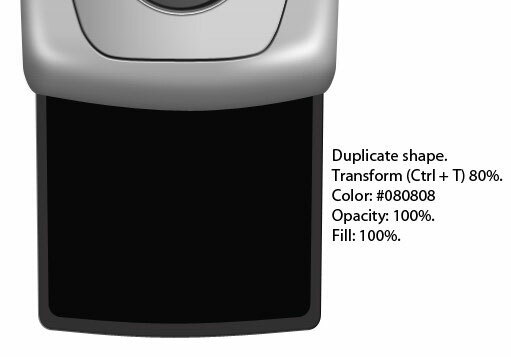 On the duplicated button that we scaled down, add an Outer Glow layer style and a Bevel and Emboss layer style. Remember the first inner layer we created? Duplicate that layer. 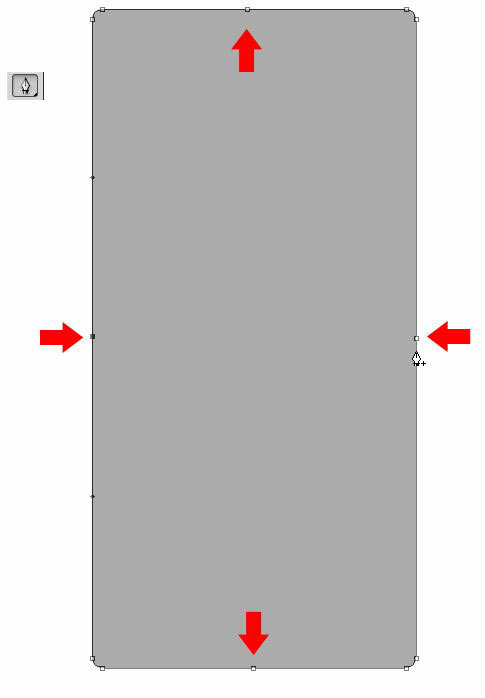 With the Pen Tool (P), draw a path that arcs, and make sure that the Intersect path areas option for the Pen Tool is selected. 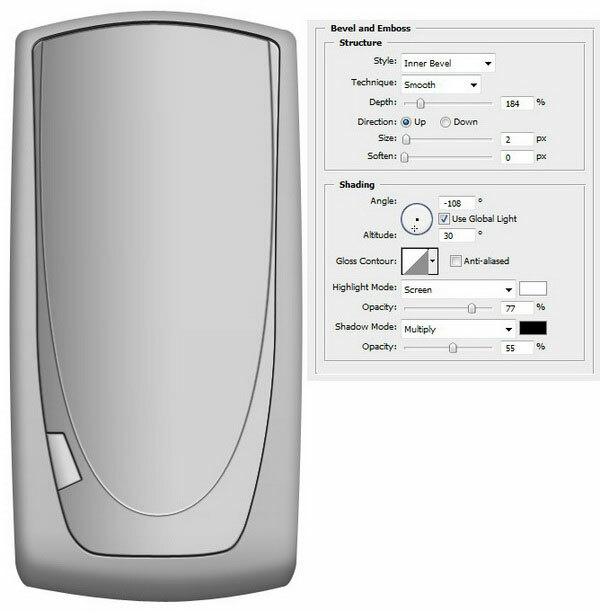 Give the second inner area an Outer Glow layer style and a Bevel and Emboss layer style. 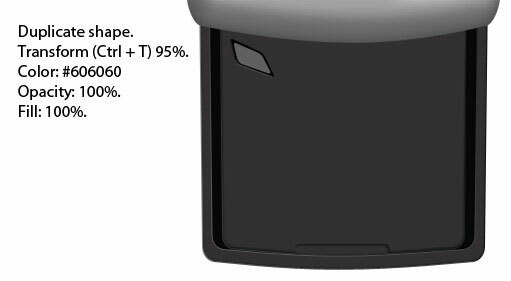 Again, duplicate the previous shape and scale its size down to 99%. 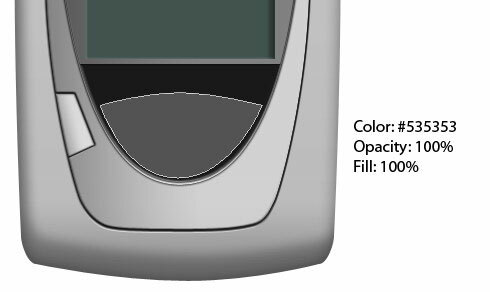 Set its fill color to black (#000000) and lower its Fill Opacity to 40% so that it appears darker than its background but also lets the gradient overlay of the shape below it show through. 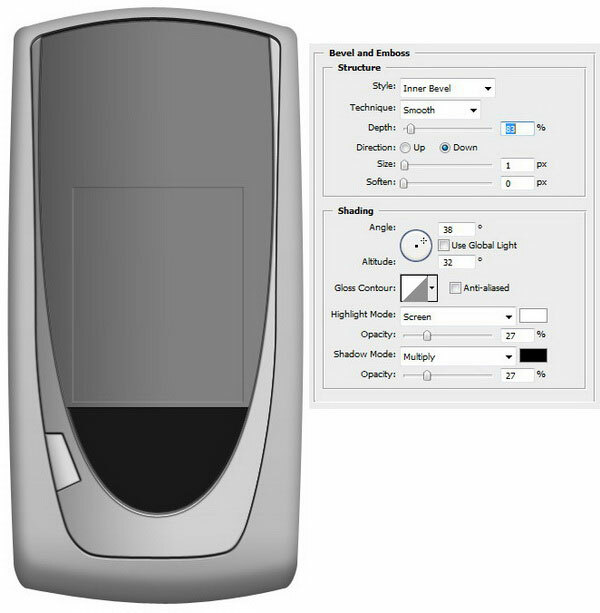 Give the duplicated shape a Bevel and Emboss and an Outer Glow. 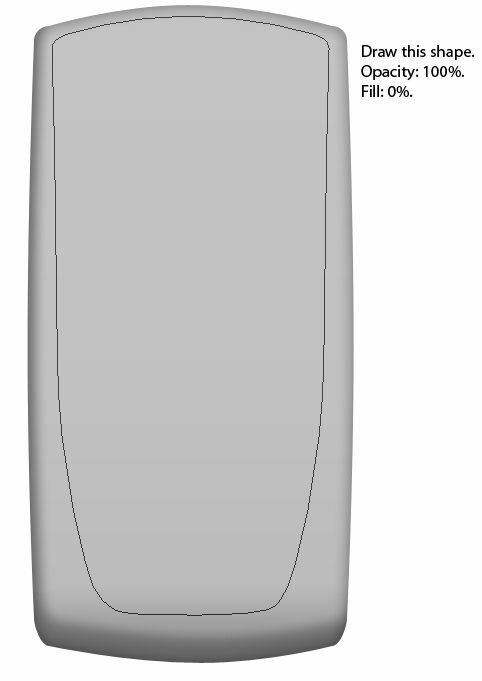 Next up, we will need to create an area at the bottom of the second inner shape for the main mobile phone buttons. 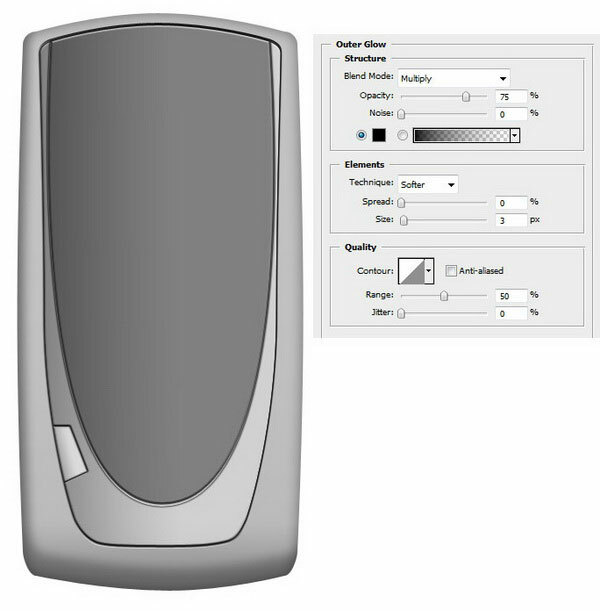 First, duplicate the shape from the previous step. Use the Rectangle Tool (U) to make rectangular path at the bottom (remember to select the Intersect path areas option). Set the color of this path to black and make sure that it has 100% Opacity and 100% Fill. 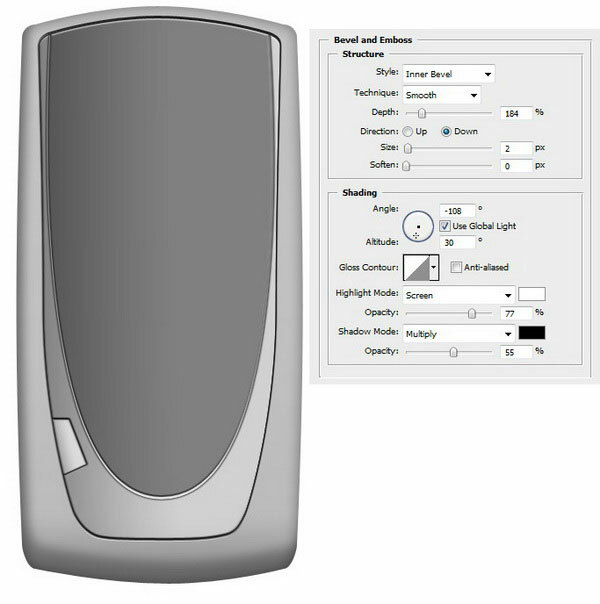 Give this shape a Bevel and Emboss layer style. 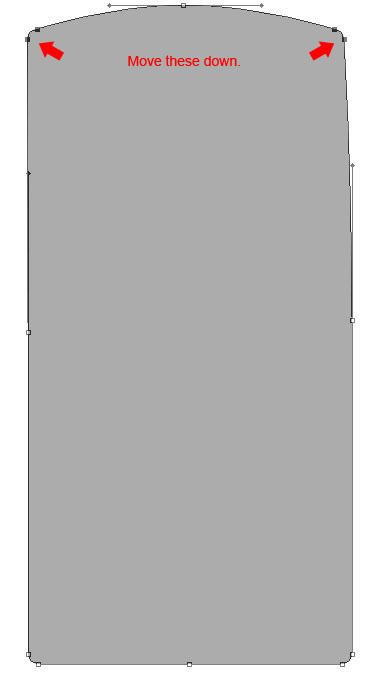 Use Rectangle Tool to draw the screen’s shape. It shouldn’t have a fill color. Give it three layer styles: Bevel and Emboss, Inner Shadow, and Color Overlay. 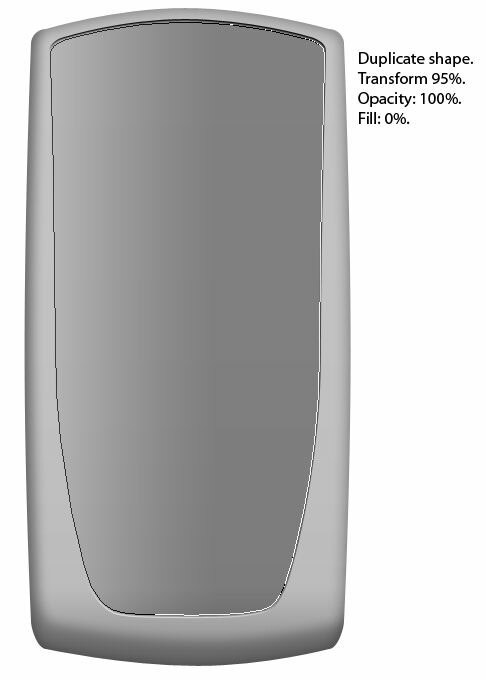 Draw an arced shape with the Pen Tool as shown below. Give this shape a Bevel and Emboss layer style and a Gradient Overlay layer style. Above the main button, create another button shape. 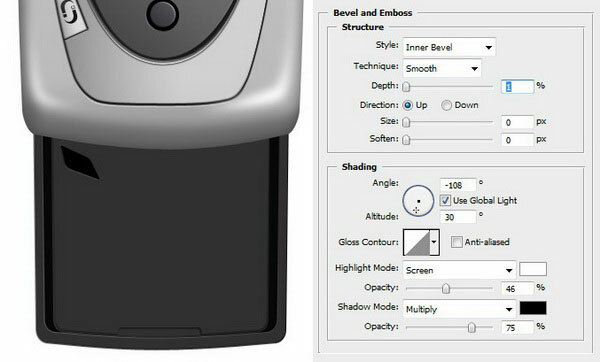 We will use the same layer styles as with the main button (Bevel and Emboss and Gradient Overlay). 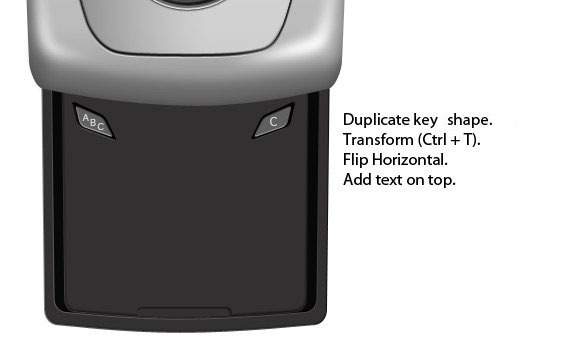 Just duplicate the left button, hit Ctrl/Cmd + T to enter Free Transform, right-click inside the transform box and choose Flip Horizontal from the menu that appears. Afterwards, use the Move Tool (T) to move it to the right side. 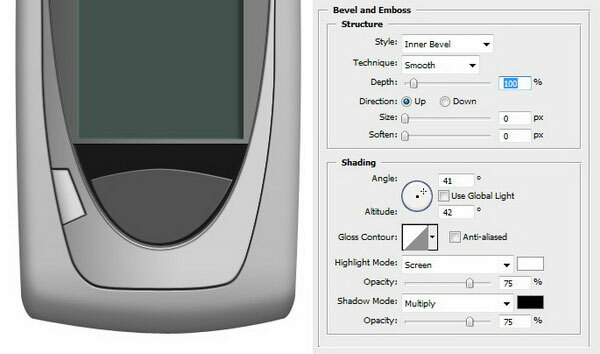 Draw a circle shape in the middle of the main button using the Ellipse Tool (U). Hold down Shift to make a perfect circle. 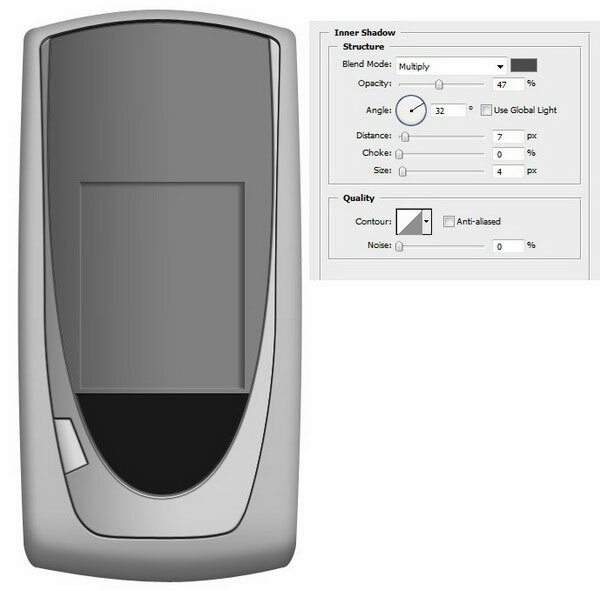 Give the joystick’s background a Bevel and Emboss layer style. Draw another circle shape (or just duplicate the joystick background and scale it down and change its Color). 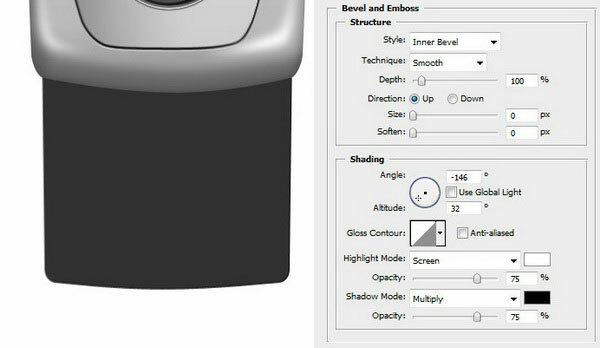 Give the joystick control a Bevel and Emboss and a Gradient Overlay. 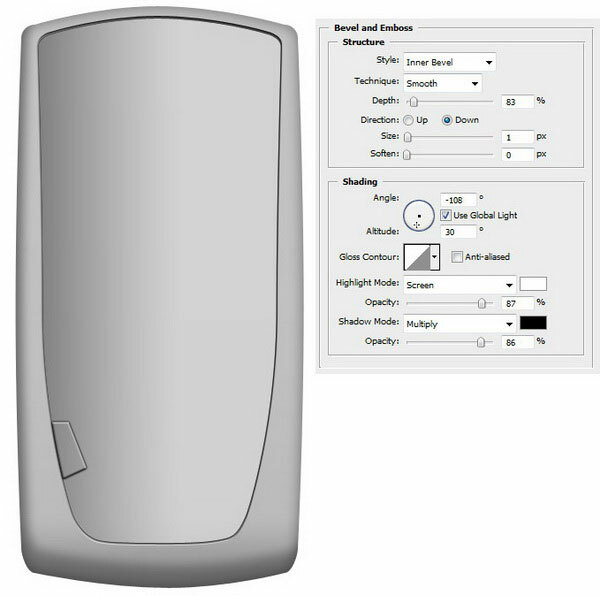 Just draw a simple polygonal shape on each button using the Pen Tool (P). Feel free to replace them with a shape of your own. 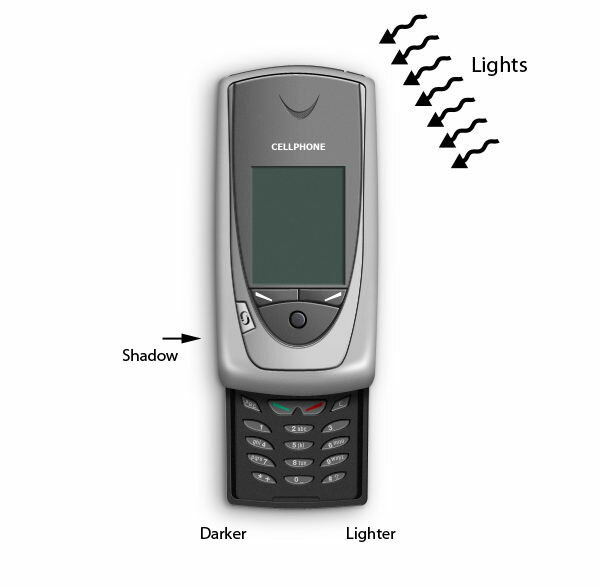 The cell phone shape is very flat at the moment; we will fix that by adding some highlights and shadows. Draw a path for the highlight on bottom right corner. Convert this path into a selection by right-clicking inside the path and choosing Make Selection (or just press Ctrl/Cmd + Enter). Create new layer and fill (Edit > Fill or Shift + F5) your selection with white (#ffffff) on this new layer. Deselect your selection (Ctrl/Cmd + D) and then apply a Gaussian blur filter (Filter > Blur > Gaussian blur) with a Radius of 5px. Just duplicate the highlight layer we just drew and flip it horizontally (Edit > Transform > Flip Horizontal). 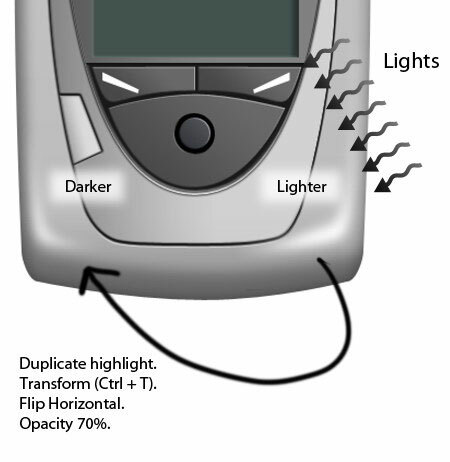 Place the flipped highlight on the opposite side using the Move Tool (V). 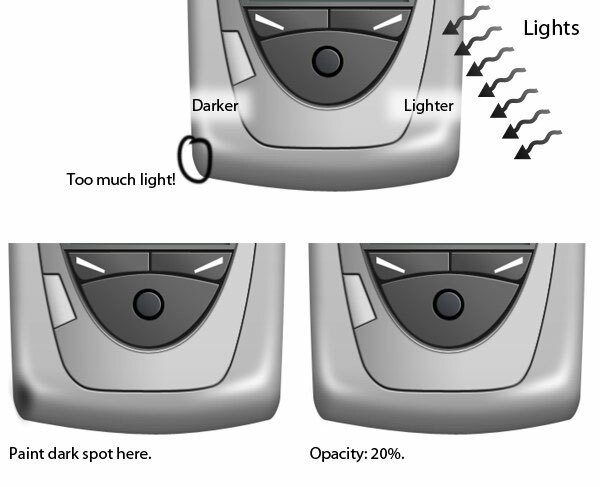 We must remember that our light source is from the top right, so the highlight on left side should not be as strong as the right side. 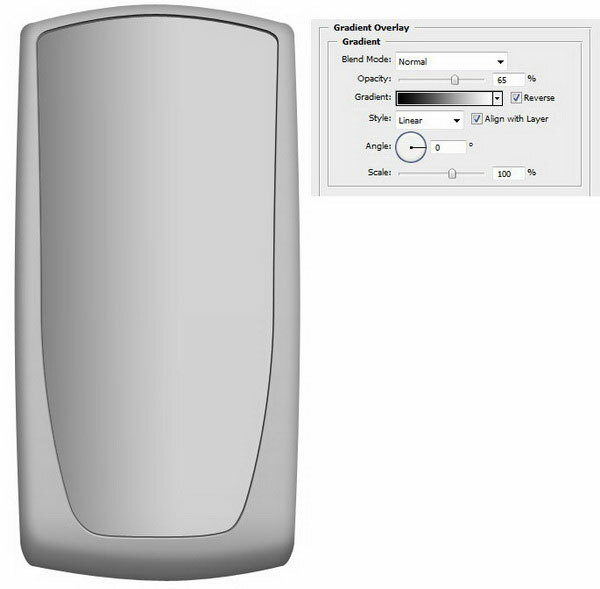 To lower its brightness, simply reduce the layer’s Opacity to 70%. Create a new layer for the dark spots on the bottom corners. 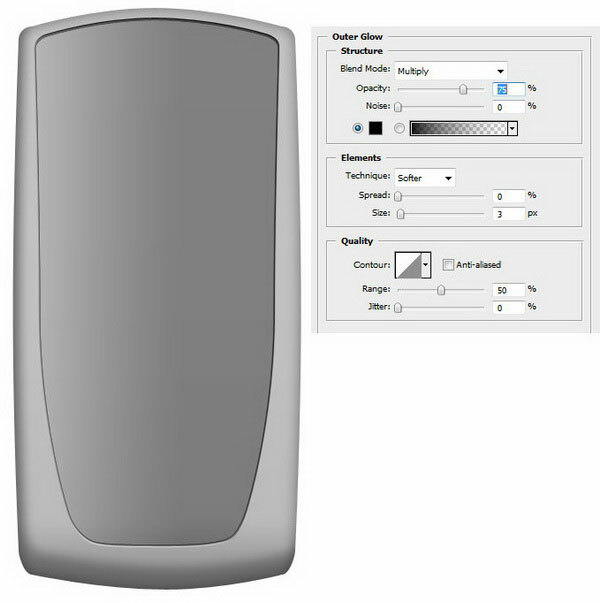 Use the Brush Tool (B) to paint a dark spot on bottom left corner and reduce the layer’s Opacity to around 20%. Below, you can see the difference before and after the highlights and shadow. These small and subtle details add big differences to the realism of our work. Draw a sort of half-moon shape for the speaker using two ellipses and the Ellipse Tool (U). See the image below to guide you. 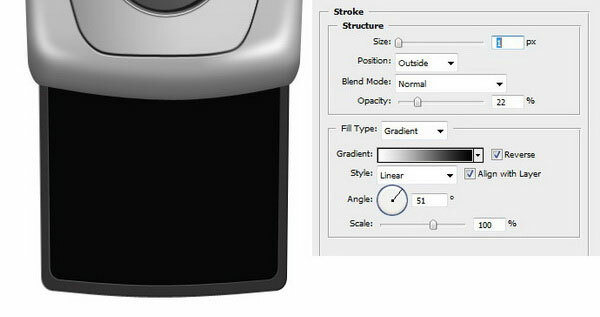 Set the Opacity to 100% and Fill to 0% and choose the Subtract from from path area option. 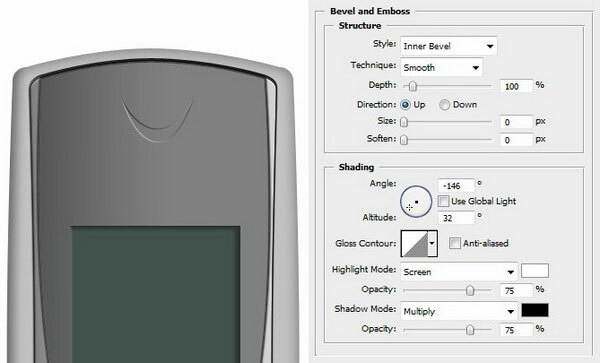 Give the speaker shape a Bevel and Emboss, an Inner Shadow, and a Gradient Overlay. Let’s create a pattern for the inner part of the speaker. 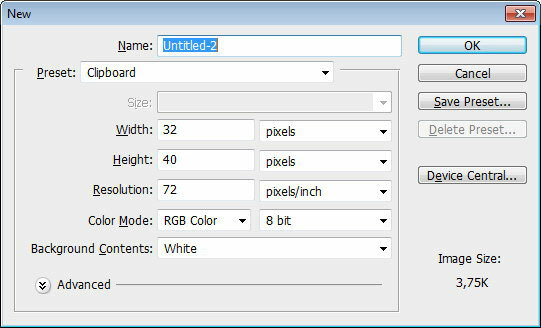 To start, create a new Photoshop document with size of 32x40px. Use the Zoom Tool (Z) to zoom in really close to the canvas. 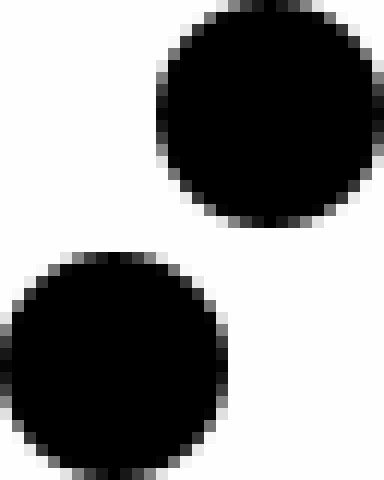 Draw a black circle at the top right corner. Duplicate the circle and place it on the lower left corner. Save the pattern by selecting around the canvas (Ctrl/Cmd + A) and going to Edit > Define Pattern. I named our pattern "2 dots", but feel free to name it anything you want. Return to speaker layer. Double-click the layer to access the Layer Styles dialog window. Add a Pattern Overlay layer style, choosing the "2 dots" pattern we created from the Pattern dropdown menu. 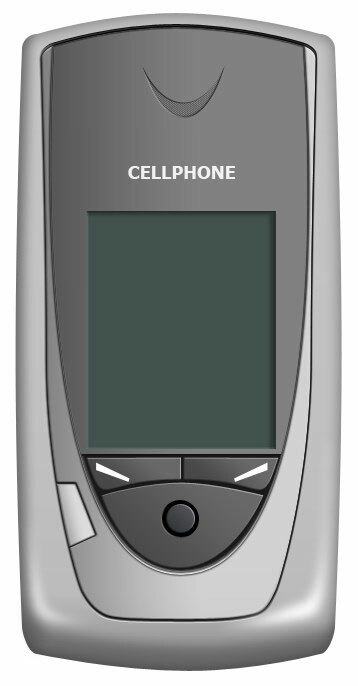 We won’t get fancy with our mobioe phone’s name. 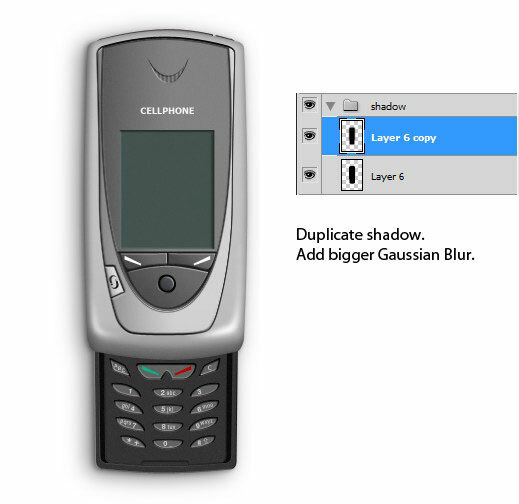 Just use the Horizontal Type Tool (T) to write a simple text block for the cell phone’s brand (in my case, I just called it "CELLPHONE"). 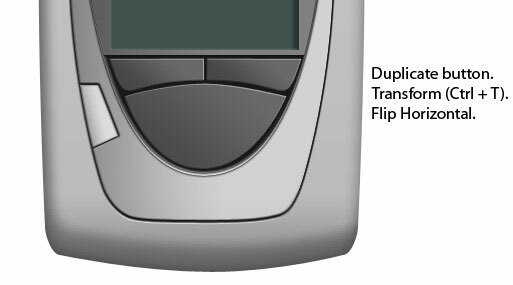 Remember the button we drew on the left side of the phone? We’ll revisit it and give it an icon. 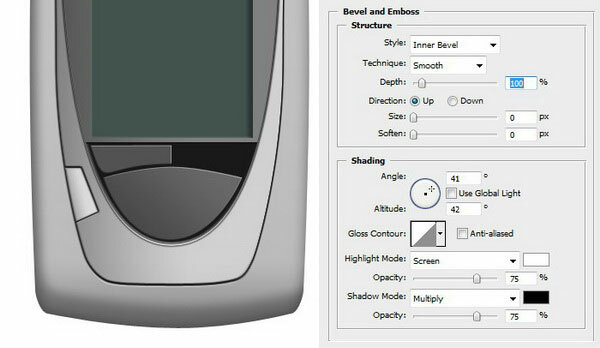 Start by creating a small rounded rectangle with the Rounded Rectangle Tool (U). Duplicate the path and move it a few pixels down and right. 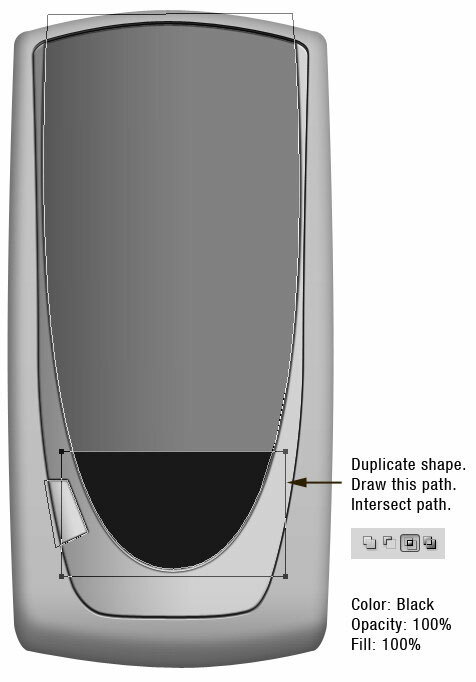 Transform the duplicated path’s size to around 95% of the original and select the Subtract from path area option. Then create a rectangular shape on the left side, also selecting the Subtract from path area option. Add an Inner Shadow layer style to give the "connectivity" icon a debossed effect. 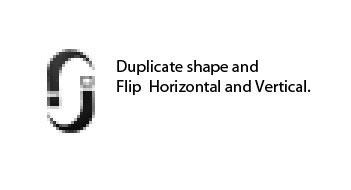 Duplicate the shape, flip it horizontally (Edit > Transform > Flip Horizontal), and then flip it vertically (Edit > Transform > Flip Vertical). Move this button on top of the left side button. Use Free Transform to angle it appropriately. 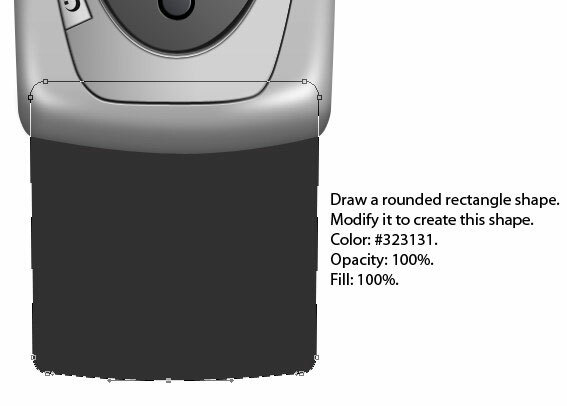 Draw a rounded rectangle with the Rounded Rectangle Tool that goes across the top of the mobile phone. 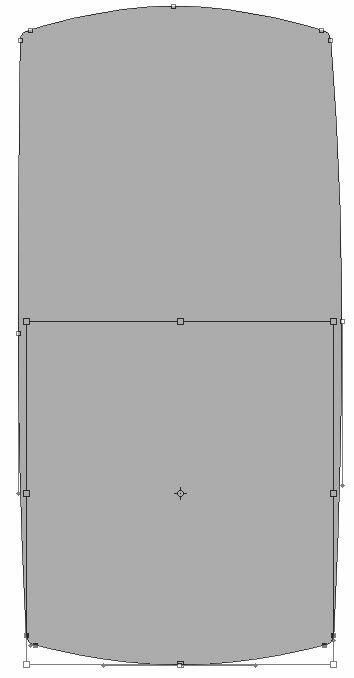 Add a new anchor point at the top middle of the rounded rectangle’s path (using the Pen Tool) and pull it up to create an arc at its middle. Draw a triangular path and select the Subtract from path area option to make an indentation at the top of the cell phone. Apply an Inner Shadow layer style and a Bevel and Emboss layer style to give it a 3D effect. 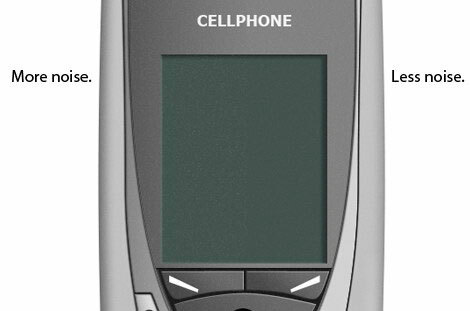 Our phone is a sliding mobile phone. 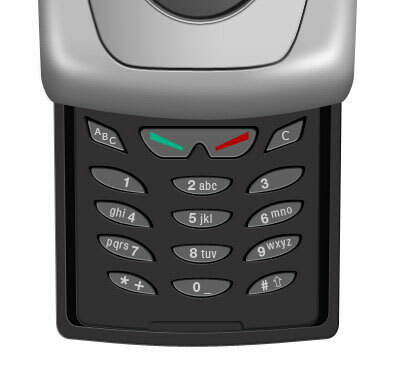 When you slide it down, the keypad is revealed. 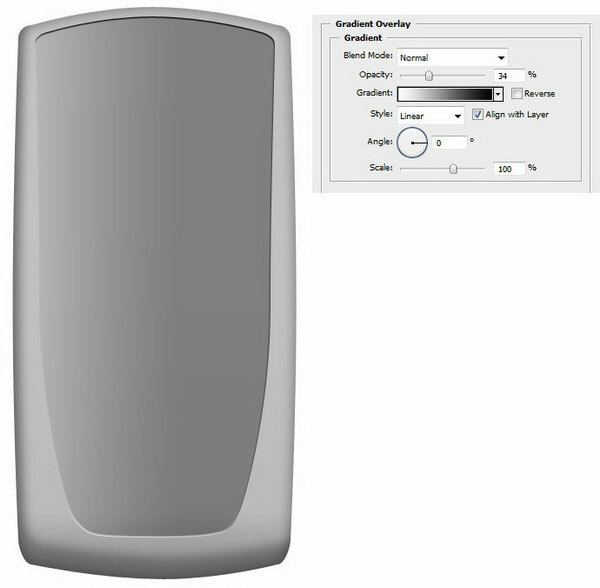 Let’s draw this keypad starting with the base shape. 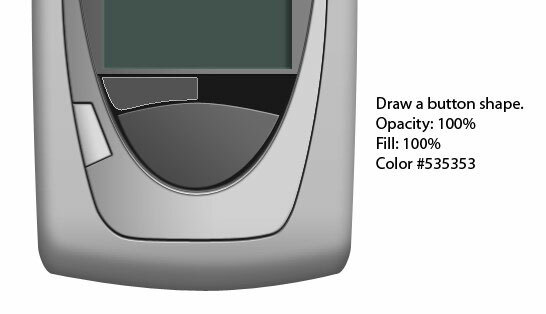 Use the Rounded Rectangle Tool to draw a rounded rectangle at the base of our cell phone. 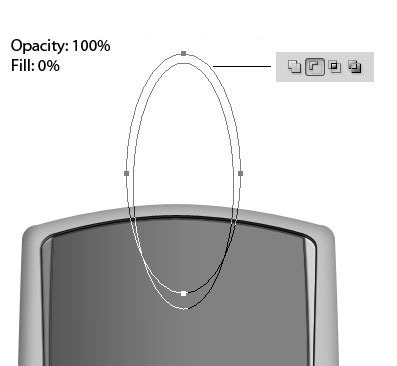 Use the Pen Tool to modify the rounded rectangle’s anchor points to get the shape depicted in the image below. 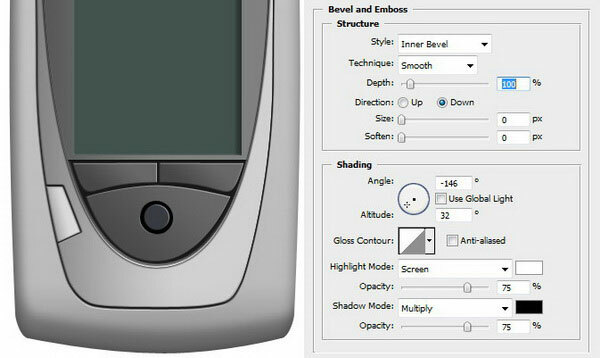 Give the shape an Inner Shadow and a Bevel and Emboss to give it a 3D effect. Next, we need to create the inner area of the keypad. 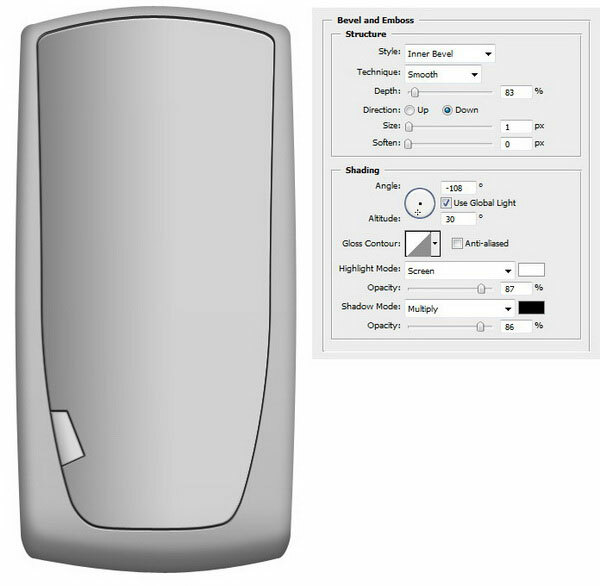 Start by duplicating the base shape and then transforming the copy to a smaller size (about 80% of the original size). Also, change its color to #080808. Add an Inner Shadow layer style and a Stroke layer style. 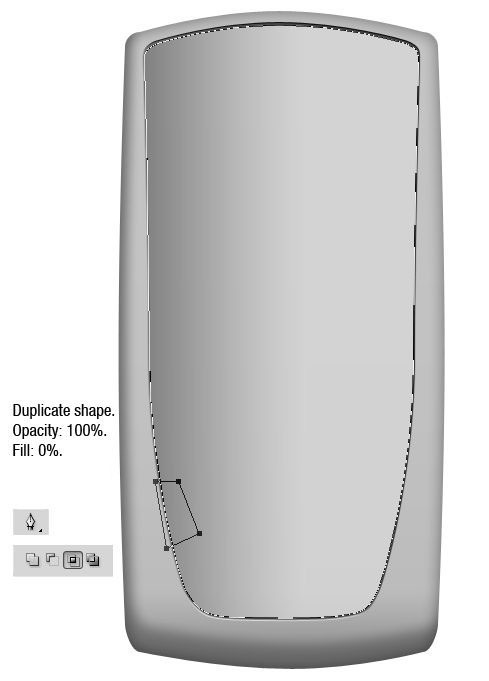 Duplicate the previous shape, then resize it down. Change its color to #323131. Give the second inner shape a Stroke and an Inner Shadow. Duplicate the second inner shape. 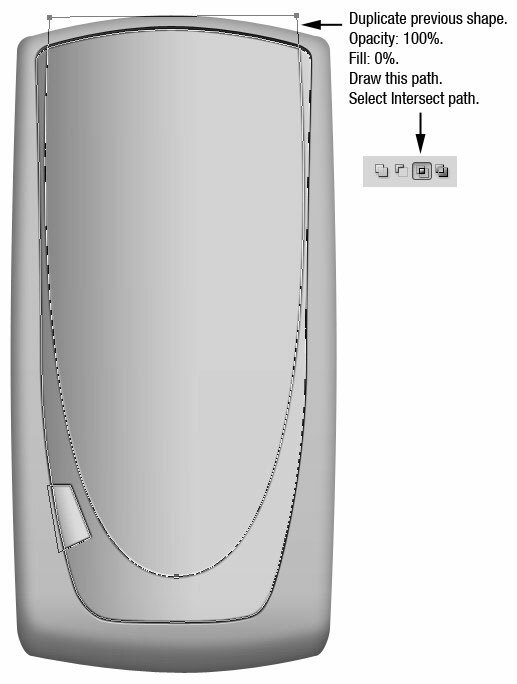 Draw a rounded rectangle path at the center bottom and select the Intersect path areas option. Give this shape an Inner Shadow to create the effect of an indentation. Now we need to create the keys for our key pad. Start by drawing a black rounded rectangle and modifying its anchor points with the Pen Tool until you create an irregular diamond shape. 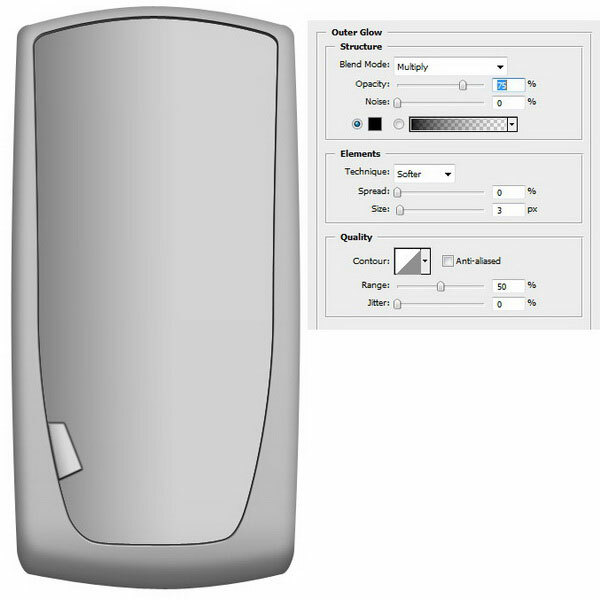 Duplicate shape we just created and resize it down to 95% of the original size. Change its color to #606060. Add a Bevel and Emboss layer style onto it to give it a 3D effect. Use the Horizontal Type Tool (T) to type some letters onto the key. 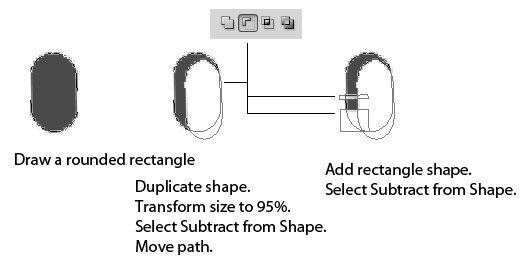 Duplicate shape we created, press Ctrl/Cmd + T to activate Free Transform, right-click inside the transform box, and choose Flip Horizontal. 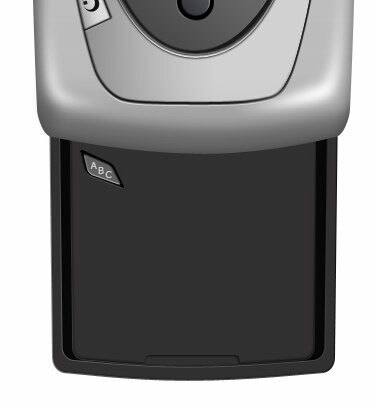 Move this to the other side of the keypad and also add a different letter using the Horizontal Type Tool (T). At this point, you already know how to draw a key on our keypad, so I’ll let you use your creativity to finish it up. Use the techniques we’ve already discussed. In real life, nothing’s perfect — there’s always some sort of defect on every product; whether it’s through normal wear-and-tear or a manufacturer’s shortcomings, cell phones will always have imperfect surfaces. To make our work as realistic as possible, we need to add these flaws to our design. Hold down Ctrl/Cmd and click every layer’s thumbnail in the Layers Panel until the cell phone has a selection around it. 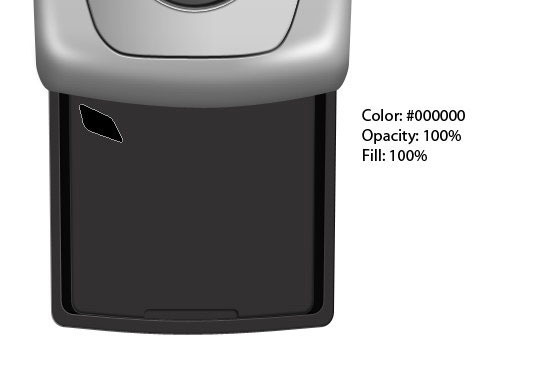 Create a new layer above all the other layers and fill it (Shift + F5) with black (#000000). After applying the filter, switch the Blend Mode to Screen and reduce the layer’s Opacity to 80%. We don’t need the noise texture to be too — shall we say, "noisy" — on our mobile phone’s screen. 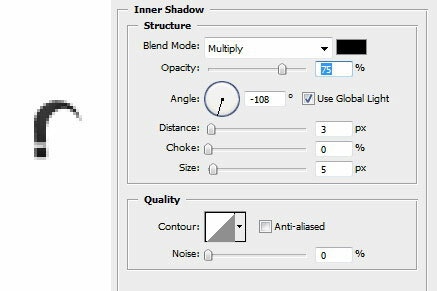 To do this, make sure to select the noise layer and then click on the Add layer mask icon at the bottom of the Layers Panel. 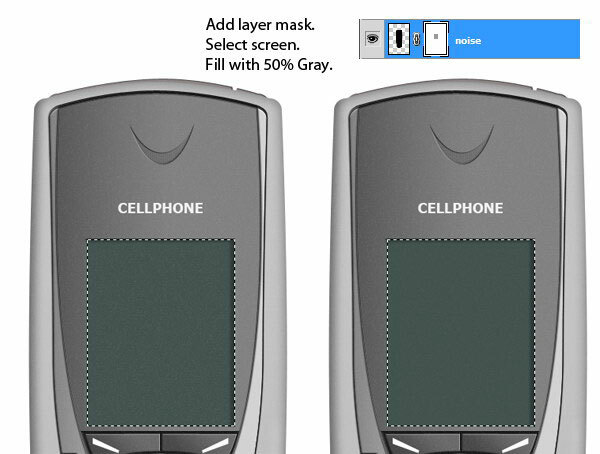 Use the Rectangular Marquee Tool (M) to create a selection of the mobile phone’s screen. Go to Edit > Fill and in the Use option, pick 50% Gray. In image below, we can view the difference before and after we remove some of the noise. The difference is subtle, yet important. Create a new layer and place it behind all the other layers in the layer stacking order. 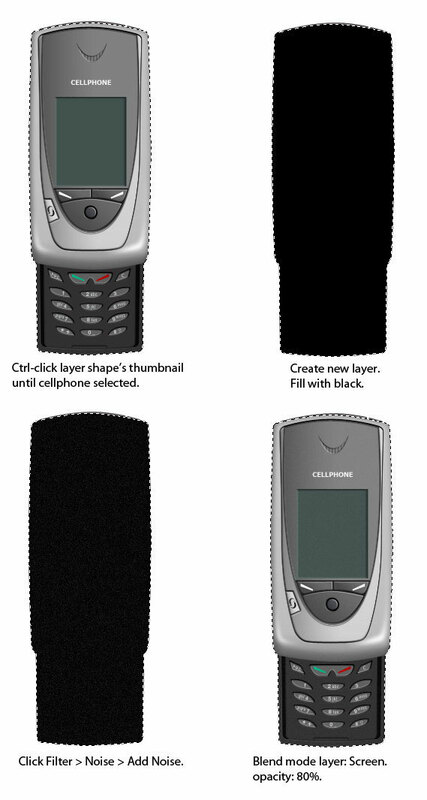 Select the cell phone again using the method we discussed previously. Fill the selection on the new layer with black. Use the Move Tool (V) to shift the filled selection down and left (because our light source is from the top right corner). 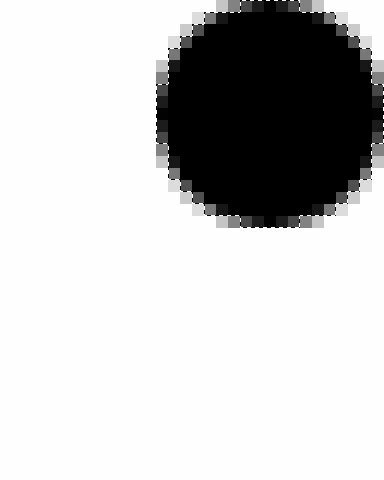 Go to Filter > Blur > Gaussian Blur with Radius at around 9px. Then, reduce the layer’s Opacity to 40%. This is the final step we need to accomplish. The shadow will cast a softer drop shadow on the floor. To do this, we just need to duplicate the previous shadow we created and apply another Gaussian Blur filter on it using a bigger Radius value. 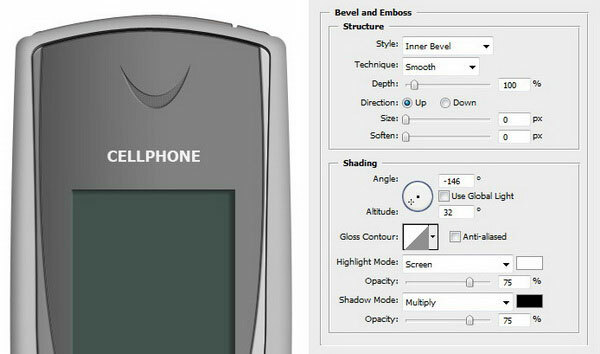 In this tutorial, we created a realistic cell phone completely from scratch using shape tools, the Pen Tool, and plenty of layer styles. I hope these techniques have imparted a few tips to you that you can incorporate into your workflow when drawing your own realistic products.